A Zeppelin flight is a unique experience, because of the low altitude of 400 to 500 m and the resulting excellent view from the panoramic windows down to the surface. Viewed from the air, our world looks delicate and small. Amazing how many large green spaces the Bavarian metropolis Munich on the Isar still has yet. Interesting is the boarding into the Airship and the getting off procedure. Since the Zeppelin Airship must not lose weight, the passengers have to get in and out individually. First one passenger out, then a new passenger in, etc. Everything works smoothly, fast and is well organized by Zeppelin NT. Playfully easy, the giant filled with the noble gas helium rises almost silently in the white-blue Bavarian sky and floats almost silently over the Bavarian metropolis Munich. Breathtaking is the view from the large panoramic windows down to the skyline of Munich and the snow-capped, majestic chain of the Alps on the horizon. The flight time is at a trip to the exhibition center 55 min - without Bauma 40 min. 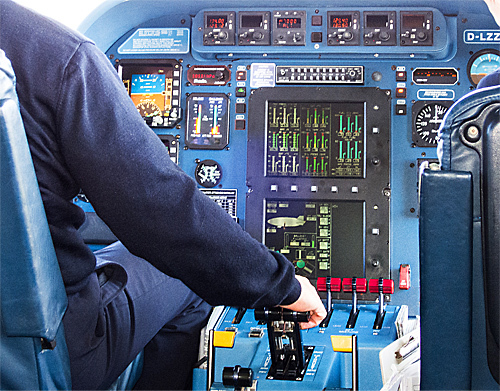 12 passengers and two crew members (pilot and stewardess) can be accommodated in the spacious gondola. Every Zeppelin passenger has a box seat. There is even a toilet in the comfortable Zeppelin gondola. The best places for photographers are in the front right (in the direction of flight) and the back left, because it can open small oval windows to take pictures without glazing. The cabin windows are very clear and the huge Zeppelin hull above the cabin largely prevents reflections in the glass. So also succeed photos through the glass windows in good quality. The semicircular panorama window in the back of the Zeppelin cabin offers another excellent vantage point. An important tip for photographers, no statif can be taken into the Zeppelin cabin. A Zeppelin flight in the warm sunset light of the setting sun is a unique experience - real sunset feeling. The Bavarian Weisswurst metropolis Munich shines magically in the pink evening light. Our flight altitude is about 400 to 500 m, fantastic for taking magnificant photos. The Airship flight time including takeoff and landing is 40 min. 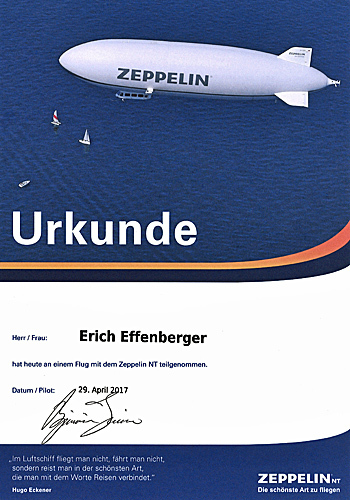 All passengers of the Zeppelin flight via Munich will receive free admission to the Flugwerft Schleissheim, a branch office of the German Museum, with their ticket. The historic seat of the Royal Bavarian Air Force (1912-1919) was extensively restored in the early 1990s and supplemented by modern exhibition halls with repair workshop. Aviation enthusiasts will find here the bizarre aircraft from the beginnings of aviation history, as well as modern jet engines and combat aircrafts. 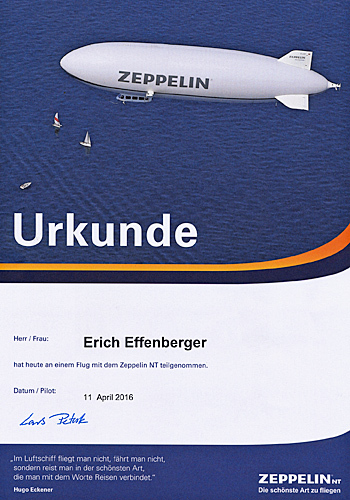 Each participant of the Zeppelin flight over Munich receives from Zeppelin NT a nice certificate as a reminder. On the grounds of the Schleissheim airfield is an airworthy Russian Antonov An-2, a nostalgic biplane. With the biplane you can make scenic flights over the Bavarian foothills of the Alps, Lake Starnberg, Ammersee, etc. 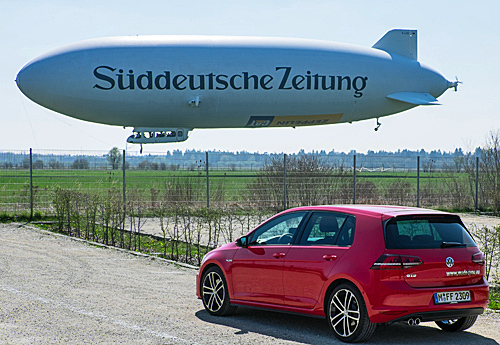 The Zeppelin Airship starts directly over the Antonow towards Schleissheim Palace and then turns south towards the famous football stadium Allianz Arena. The biplane Antonov An-2 was developed after the Second World War in the USSR and is flown for civil as well as military purposes to this day. With the powerful radial engine of 1,000 hp and the favorable aerodynamics (double decks), the Antonov An-2 is content with extremely short runways.